Building the Future — RandallAnthony Communications Inc. The Elko Engineering Garage was made possible by a $3.8-million investment by the federal government and the Faculty of Engineering at the U of A. A generous gift from philanthropists and long-time supporters of the Faculty of Engineering, Ernie and Cathie Elko, will cover the maintenance and operating costs of the new 6,000-square-foot ‘makerspace’ shop, that has been named the Elko Engineering Garage. The Elkos say that supporting The Garage is a natural fit. An engineering consultant and former president of the Canadian division of Peter Kiewit and Sons (now Kiewit), Ernie Elko grew up on a farm, chipping in and helping run the family operation. Small chores had a way of turning into bigger ones, and before he knew it, he was finding ways to make a stubborn piece of machinery work just a little longer. Mr. Elko says such tinkering or hands-on learning experiences help develop new problem-solving skills, and when students are given the chance to work with their hands, he says, their minds shift beyond just the classroom and focus on the practical task at hand. “It gives you the ability to think differently,” he adds. While Faculty of Engineering staff will be on hand to oversee operations, engineering co-op students will be on the front lines, serving as mentors and training their fellow students to use tools and machinery. Carter Trautmann is an engineering physics co-op student who has been working in the new space. He is excited about the opportunities the Elko Engineering Garage presents. “Students are already increasing their knowledge in an open, collaborative way, and building experiential, practical, hands-on skills in a way they might have missed out on otherwise,” says Mr. Trautmann. Electrical engineering student Moira Blenkinsopp is a member of the University’s Autonomous Robotic Vehicle Project team. She says the Garage will have financial implications for student teams while helping them learn about manufacturing techniques. In the past, students would have to send some designs out to shops to have them built. Now, students have the facility allowing them to do more of their own manufacturing. “Being able to have water-jet cutters, 3-D printers and CNC [computer-controlled manufacturing] machines means we can make our own robot,” she says. “In the engineering Garage, if you’ve got an idea, you can build it. If it doesn’t work, it doesn’t work – but you’ve had the experience and you gain from that,” she says. “We are grateful and honoured that Ernie and Cathie have demonstrated their confidence and trust in our faculty to enrich the education our students receive,” says Dean Forbes. “The Elko Engineering Garage strengthens our student community. Members of our alumni are invited and encouraged to give of their time and expertise here, mentoring our next generation of engineers,” he says. The generosity of the Elkos’ gift makes possible the operation of the Elko Engineering Garage, covering ongoing costs, including maintenance and salaries for engineering co-op students working in the garage. The new shop will be fully operational in January 2019. A major gift by engineering alumnus Ernie Elko and his wife Cathie will cover ongoing operating and maintenance costs of the Elko Engineering Garage. • The Elko Engineering Garage is equipped with high-tech tools in addition to more traditional hand and power tools. 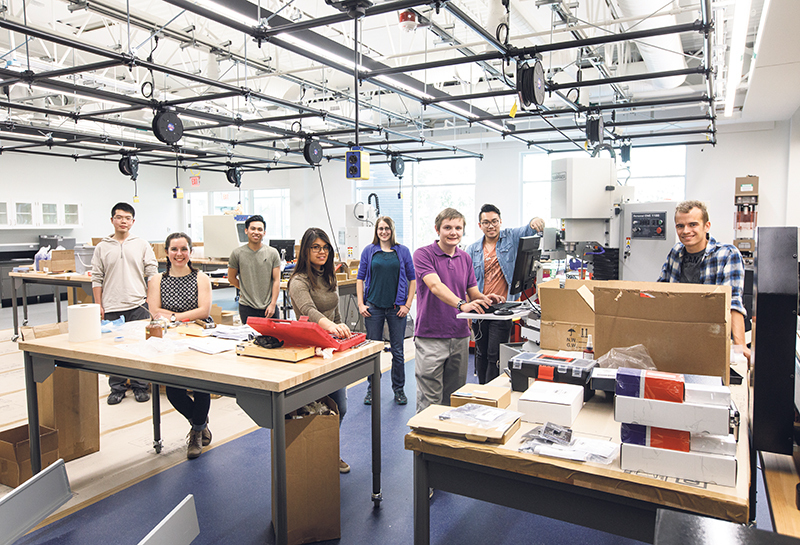 • Combined with the Mechanical Engineering makerspace and the lab in the Electrical and Computer Engineering research facility, U of A engineering students now have access to one of largest university makerspaces in Canada. • The Elko Engineering Garage is equipped with one of the largest 3-D printer collections in Edmonton, including 11 polymer 3-D printers. • The Elko Engineering Garage is also home to a Stratasys PolyJet J750 3D printer – one of only three of its kind in Canada, and the only one in Western Canada. Its ability to print ultra-fine layers, about half the thickness of a human skin cell, creates amazingly realistic surface textures. It also offers full-colour mapping, which replicates colour gradients and shadows so accurately printed objects seem to come to life. • Adjoining the Elko Engineering Garage is the ‘heavy’ work zone, a machine room with high safety, ventilation and dust control standards in place. This area allows students to use larger machinery to build with metal, wood and other materials.